deals and have lots of new RR with far off expiration dates! -$2 off Band-Aid, Licensed Character Bandages, Wags CAB Book! -$1 off Oral-B, or Zooth Toothbrush, Wags CAB Book! Quaker Cereal 15-16oz, Oatmeal Pancake Mix 32 oz, Chewy Granola Bars 10pk, Instant Oatmeal or Aunt Jemima Syrup 12 oz. Shower Gel, Body Lotion, Bath oil or Soak, 12.6 to 20 oz. I've slowly, but surely been mastering the Walgreens game. I have a question for you though. So, you have to have more items than coupons, right? Do the in-ad Walgreens coupons count towards that? Yes, you have to have at least as many items as Qs (and each RR counts as a Q). Wags Qs don't count towards that however so that's a plus! That's why I have so many pencils and plastic cups in my house! If I need more items I usually go for the .12 cups or pencils that Wags seems to have for every holiday! You usually have to use the in ad Q for those. And if my total is going to be like $5.98 you'll bet I'll throw in something for .12 cents so I can use a $6 RR instead of $5 or $5.50 where I'd have to actually pay with my own money! Okay, that is good news! I've been thinking the Wags coupons counted. So is that all Wags coupons? Or just the in-ad ones? For example, the coupons in the kids activity book??? None of the Wags Qs count so you can use the toothbrush Q and the band-aids q in the activity book and they won't count towards your totals, cool huh? Just always give your Wags Qs LAST. Their registers are a little wacky. Give your Man.Q first, then your Wags Qs and you'll be great! It's a little bit complicated but once you get the hang of it you'll be great. And when you are walking out of there with 20 Sponge Bob band-aids and 20 Barbie toothbrushes they paid YOU to buy, you'll be hooked! 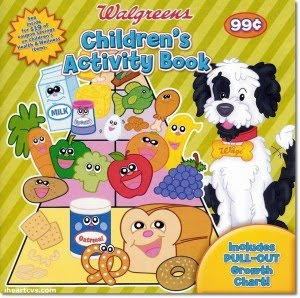 The children's activity book has coupons that are good through March and sells for $.99. It's a bit hard to find. I would look in the pharmacy or in the area where they have the coloring books. I've even seen it in the clearance section and being given away at the beauty counter as the "free gift"! Worst case scenario you could look on ebay. I haven't seen any lately but I'll keep my eyes open and if I see some I'll buy them and post on here that I have some available.